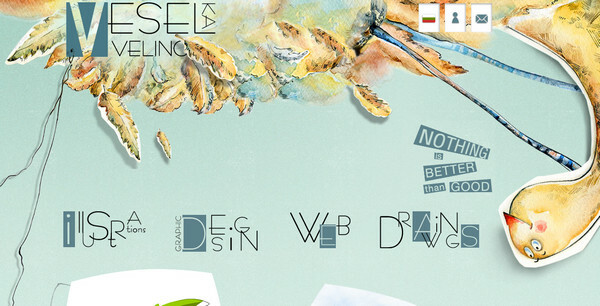 Numerous types of art have penetrated into digital designing. Many conventional art forms received its second rebirth; a prime example of this is watercolor technique that has become really popular in a world of digital design in these latter days. Another good example is photography (which is considered to be widely-used art direction) that accompanies almost every other site. 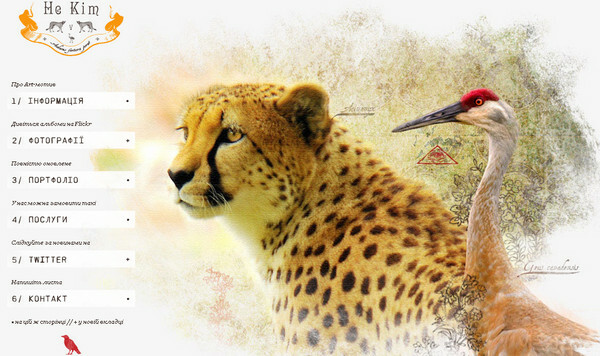 Mega realistic highly-detailed or simple vector illustrations here or there appear as a website decorations. Paper-cut technique that is generally interspersed with scrapbooking excites the minds of users. Digital collage or modern take on oil painting looks really unconventional and sophisticated, and even hand-drawn sketches are no longer associated with a simple school notebook. Generally speaking art is everywhere and it is very important for designer correctly implement it in digital project, fully relying only on fundamentals. In web design as well as in print or digital styling, artists also break conventions, experiment with various art movements, and employ diverse techniques. They successfully try to transfer or simulate different traditional art directions, utilizing powerful digital instruments and tools. 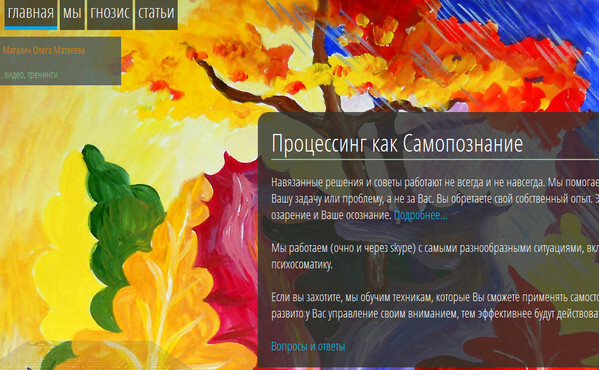 As a consequence website designs inspired by art get truly terrific and multifaceted appearance. Such projects catch the eye by means of sophisticated and exceptional ornaments, unreservedly enthralling mere spectators. Moreover such designs calmly stand out from an intense competition, becoming a sterling source of inspiration. 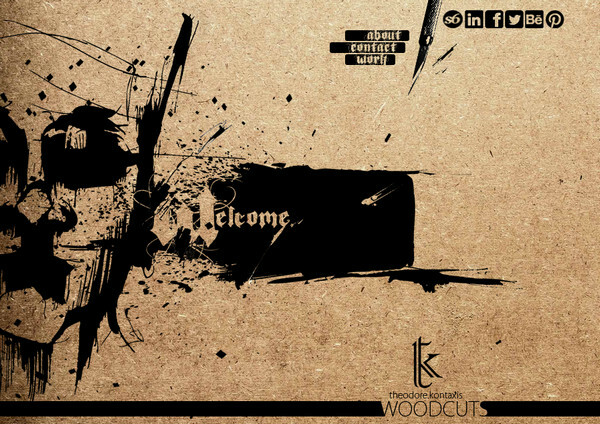 In a collection below we have included thrilling art-inspired website designs which are definitely distinct from their peers and worth checking out. 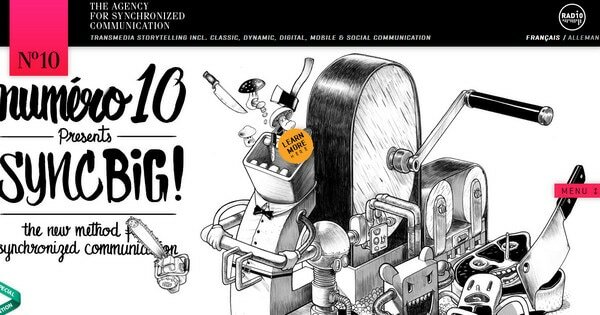 Numero 10 pulls its identity from spectacular black and white illustrations which have pencil-like touch and highly-detailed realization. Metiers d’Art has an elegant aristocratic vibe that is achieved by means of light grey background with wonderfully incorporated divine image made in grayscale mode. Pracownia Olszanska causes mixed feelings due to extraordinary and truly unconventional appearance, including peculiar scrapbook style realization. 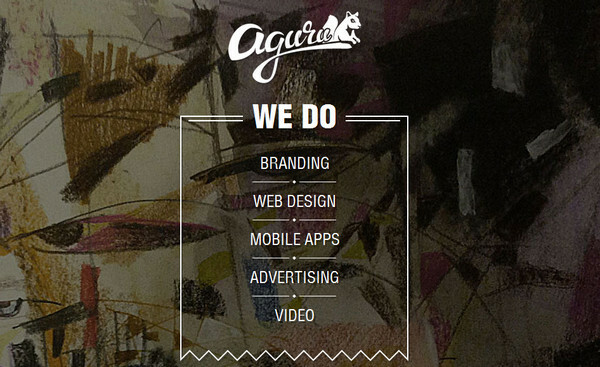 Aguru Design Studio leverages beautiful dark artistic background that perfectly emphasis white menu with straightforward typography. YSD relies strongly on dark grunge textures and big bold type that are complemented by glossy wide rectangular light beams. 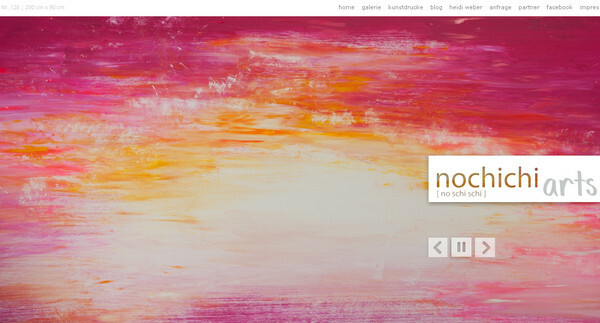 Nochichi Arts makes use of huge full-screen slider that reveals different abstract watercolor artworks. 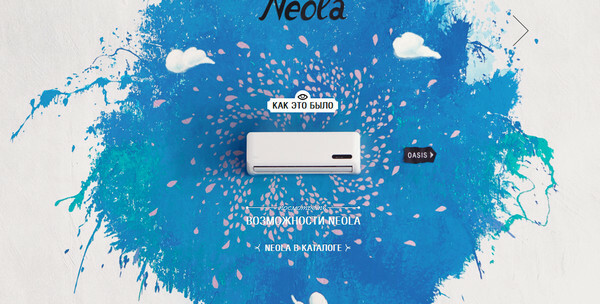 Midea grabs users’ attention by big bright stain of paint that primarily serves as a decoration element. The Crab Pot has an astonishing nautical header that is made by means of wonderful combination of watercolor effect and multi layered paper-cut approach. 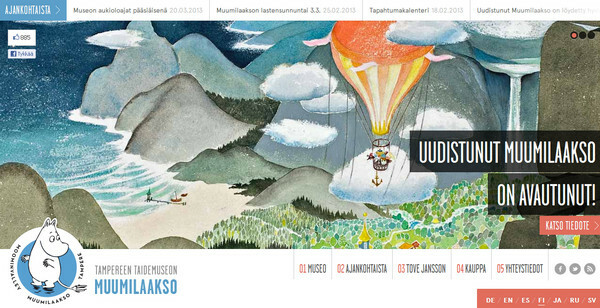 Muumilaakso is another good example of utilizing huge slider in order to showcase magnificent vibrant high-quality artworks. Summer Opening has a strong grunge vibe, although website design basically utilize light color palette, including vivid positive orange hue. H-Psy uses set of truly flamboyant images that alternate in the post of background. Since website is dedicated to psychology, every illustration is aim to cause good feelings. 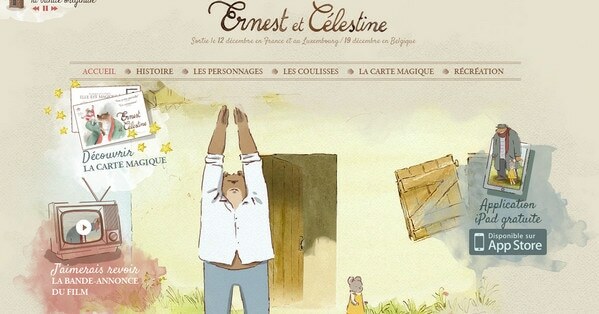 Ernest et Celestine has a kindly and affable atmosphere that is achieved by use of pastel colors, aquarelle technique and amiable images. Summer Closing screams grunge style in conjunction with artistic watercolor touch. Variation of different brown and red shades makes a design look soft and warm. Sasa Foric has nicely incorporated nature-inspired illustration mainly made in blue and light pink colors that looks truly sophisticated. 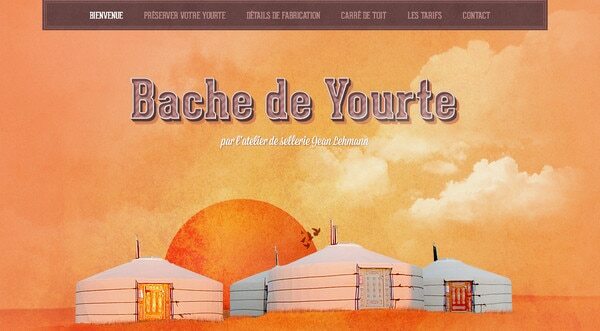 Bache de Yourte welcomes its users with ardent picture that simply burns with heat and has pleasant atmosphere. 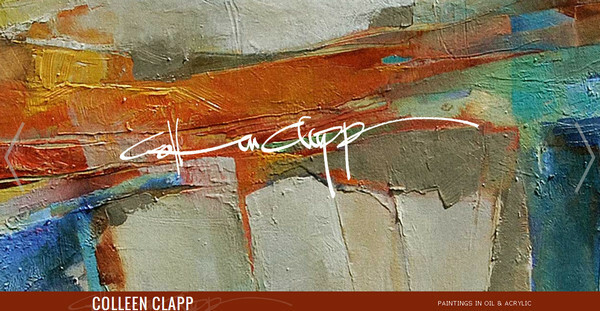 Colleen Clapp has a remarkable abstract oil-painted background that has a strong artistic vibe. Qudres uses heavy textures, monochromatic hand-drawn illustrations made in different colors, hand-lettering typography and slider with artistic images. Veselka Velinova is an artistic take on paper-cut technique that is wonderfully combined with watercolor treatment. 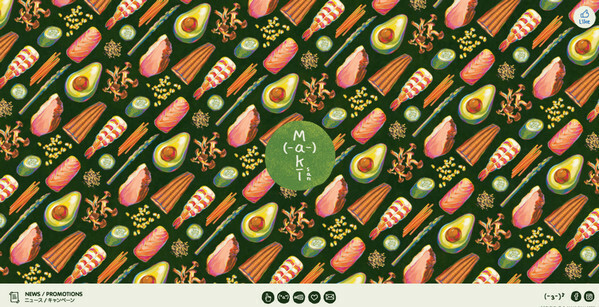 Maki-san leverages repetitive sushi-themed pattern as a background that conveys slightly psychedelic feelings. Passeio Pedra Branca utilizes a bunch of slightly transparent colorful intersecting aquarelle blots that are traced throughout a whole design. Not a Cat wonderfully blends together artistic background with grunge touch and accurately derived images of animals. 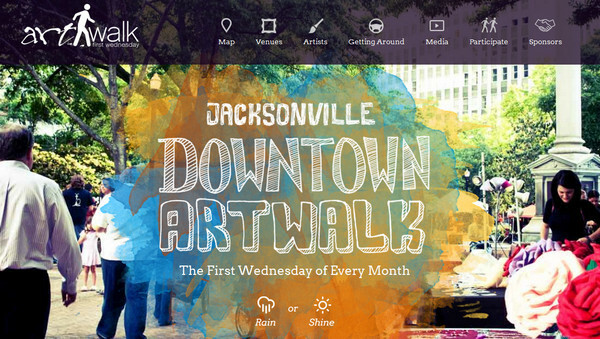 Jacksonville Artwalk perfectly mixes together semi-transparent watercolor spot, dramatic graffiti typography and urban photo background that all together make a website look simply engaging. Woodcuts is chiefly based on black pen-styled illustrations that have intentionally slattern outward and printed on rather rough cardboard background. 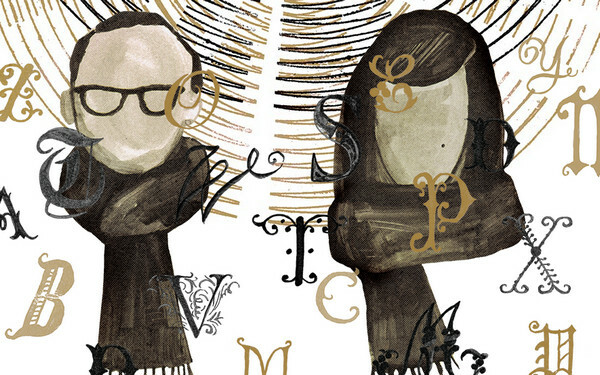 Jess and Russ looks enigmatic and artistic through amazing vintage typography and dark wash drawing illustrations. 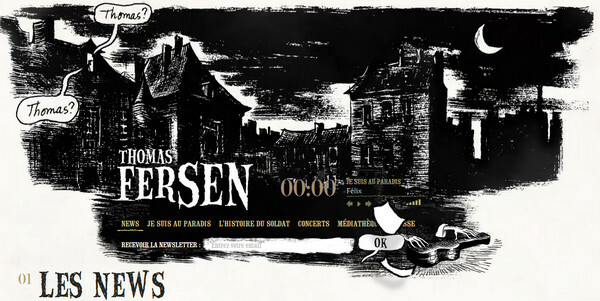 Thomas Fersen breaks the monotony of conventional grid-based blog design by means of artistic truly dark illustrated header that has old urban motives. 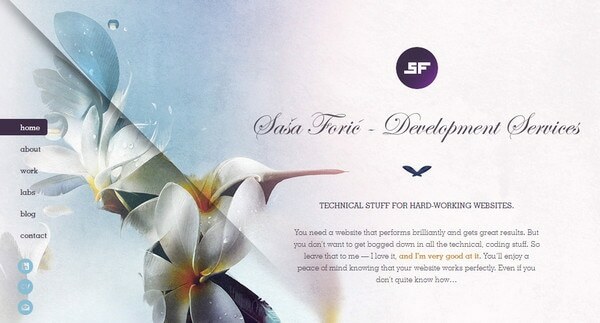 Website designs with artistic touch are truly versatile. You can come across different techniques and approaches that set a proper mood by adding slightly noticeable or vice versa conspicuous elements with easy recognizable styles. One of the most common methods is to use watercolor effect or highly-detailed massive hand-drawn illustrations in conjunction with such widely-spread art directions as typography or photography. 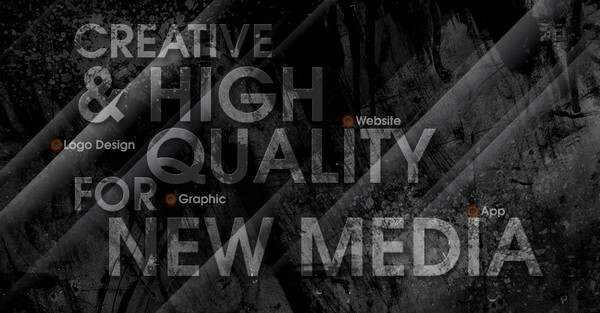 In such cases website designs looks distinguished and sophisticated. So it’s time to share your opinion. What do you think of our collection? 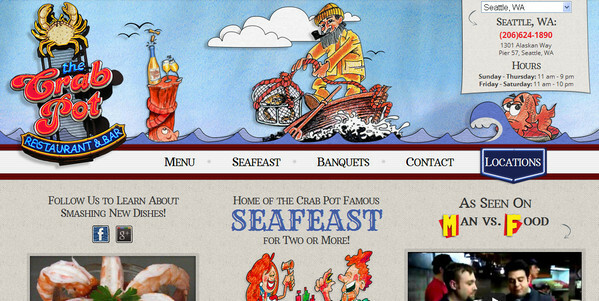 What do you think of using traditional art in website design? Is watercolor effect properly adding a note of artistry? 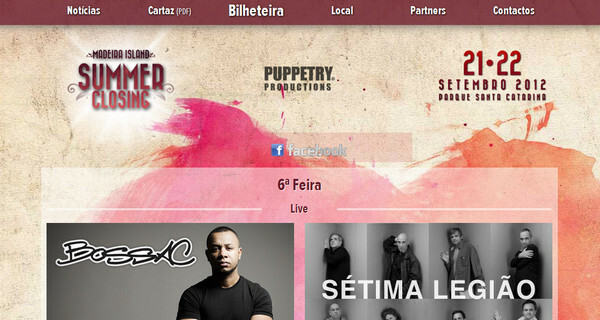 Do you know any other good examples of art-inspired website designs? These are truly inspiring, as I’ve recently started a blog about my artworks/ designs/ creativity at comehereprojects.wordpress.com and plan on learning how to create websites in the near future. It’s amazing how one comes to the realization that: what you thought was an idea, someone already implemented it.